Republican presidential candidates are shockingly uninformed about foreign policy. Even without Trump, the Republican field seems clueless on the basics. 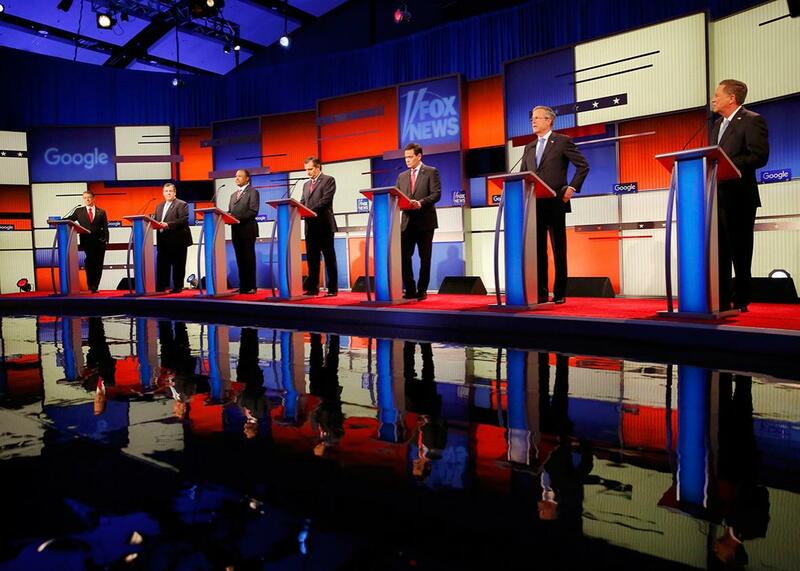 Rand Paul, Chris Christie, Ben Carson, Ted Cruz, Marco Rubio, Jeb Bush, and John Kasich stand at their podiums during the Fox News debate in Des Moines, Iowa, on Jan. 28, 2016. Thursday night’s Trump-less debate was less blustery than the Republicans’ previous spectacles, but on foreign policy issues, the Donald’s absence didn’t make it less slight, cynical, or shruggingly uninformed. Earlier in the week, Robert Gates—a lifelong Republican who has served as secretary of defense and CIA director—said the GOP candidates’ discussion of national security issues “would embarrass a middle schooler.” If Gates tuned in Thursday night, he would have had no cause to revise his assessment. Sen. Marco Rubio started off by promising that, if—or, rather, when—he’s elected president, “We are going to rebuild our intelligence capabilities, and they’re going to tell us where the terrorists are.” Rubio seems unaware that President Obama has vastly boosted spending on intelligence and that the spy agencies’ No. 1 priority is to find terrorists. But Rubio went further: Under his administration, he said, “If we capture terrorists, they’re going to Guantánamo, and we will find out everything they know.” I think this means that he would bring back torture—a technique that George W. Bush ended in 2006. None of the other candidates, or the questioners, seemed to mind. Cruz also said—obligatory in these settings—that Obama has “dramatically degraded our military,” noting that since the 1990 Gulf War, the number of U.S. planes and ships has diminished by half. Assuming those figures are true, he ignores that the combat power of those planes and ships has dramatically grown. Would Cruz prefer trading today’s military for the one of 25 years ago? That’s the right question, if he’s going to raise the issue. Any general or admiral would choose today’s. Rubio went further, saying we now have the smallest Army since World War II, the smallest Navy in 100 years, and the smallest Air Force in history. Again, I don’t think any general or admiral would make the trade. The number of ships, planes, and soldiers is not all that counts. Gov. Chris Christie charged that the National Security Agency reform bill “made the country less safe,” apparently not recognizing that its effect—to remove metadata files from the agency’s headquarters and store them with the phone companies (and allowing the agency to retrieve them with a court order)—was, in fact, suggested by Gen. Keith Alexander, the NSA director at the time. Alexander assured the members of Obama’s reform commission, as well as many lawmakers on Capitol Hill, that the measure would have negligible effect on counterterrorism. Jeb Bush said, “We need to arm the Kurds, embed troops with Iraqi soldiers, support Sunni tribes,” and help a “Sunni-led force to take out ISIS.” He seemed unaware that President Obama is doing all of those things, though admittedly, the final and crucial piece—organizing a Sunni-led force—is slow going because some of the Sunni nations fear and loathe one another more than they fear and loathe ISIS. How would any of these candidates better deal with that problem when they apparently don’t know it exists? Rubio, Bush, and Cruz all said they’d loosen the rules of engagement that supposedly constrain U.S. forces fighting and bombing ISIS. But they didn’t specify how they would do this (except for Cruz with his call for carpet-bombing) or what effect the loosening might have. On the subject of letting Muslims across our borders (or perhaps all immigrants, it was unclear), Rubio called for tighter border security, saying, “I don’t know anybody who’s against vetting” the people who want in, “except Barack Obama and Hillary Clinton.” In fact, as he must know, the vetting procedures, especially for refugees from the war-torn countries of the Middle East, are extremely strict: Applicants have to go through numerous steps to gain admission; very, very few pass the test. Christie said, “The problem is, Barack Obama has made law enforcement the enemy,” then, perhaps remembering who the party’s likely opponent might be this November, “Hillary Clinton has made law enforcement the enemy.” It’s never been clear what people are talking about when they say this about Obama. It’s just weird to say it about Clinton, who, as Obama’s secretary of state, had no jurisdiction over such matters. First, it’s unclear what or how many secrets wound up on her private email, or how or why. Mishandling of classified information is a misdemeanor, which could turn out to be a problem for her; but even the sources of leaks about these incidents have acknowledged that she’s not the target of a criminal probe and that the lapse had no national-security impact. Second, Christie seemed to be saying that, as president, he would put political pressure on a matter that should be left to the Justice Department. But third, it seems that, fully knowing his quest for the White House is hopeless, he’s really angling for a job as President Trump’s attorney general. Gov. John Kasich, who casts himself as the reasonable moderate in these shows (he often begins answers by saying, “Look… ”), replied, when asked how he would deal with the world’s trouble spots, “We have a unique opportunity to connect with people around the world because there’s an existential threat against all of them … Arabs, Turks …bring them all together” to fight ISIS. Again, it’s not as if Obama and Secretary of State John Kerry aren’t trying to do this—or as if they didn’t actually accomplish this sort of unity, with surprising success, in leading the six countries that negotiated the nuclear deal with Iran. Of course, a Republican debate wouldn’t be complete without someone promising to cancel that nuclear deal on his first day in the Oval Office. The chore fell to Rubio this time, even though, as the moderators pointed out, the deal is already in effect, the sanctions have been lifted, Europeans are signing business contracts in Tehran, and the Iranians have dismantled much of their nuclear infrastructure, as the deal required. What, one of them asked, would America’s unilateral cancellation accomplish? Rubio replied, “Nations will have to make a choice: They can do business with Iran or they can do business with America.” Really? He’s going to cancel all business with Europe to get out of a deal under which Iran has surrendered 98 percent of its enriched uranium, two-thirds of its centrifuges, and all its heavy water, and allowed unprecedented measures of inspection on its own soil? Finally, I for one will miss Dr. Ben Carson on that inevitable day—it may soon be coming—when he drops out of the running. Has a less likely political candidate, a drowsier creature of any aspiration, ever stood behind a podium on prime-time television, except for comic effect? When someone finally asked him a question, he looked startled and giggled a bit, as if to say, You mean you’re still taking me seriously? You’re still pretending that I’m here? I think it’s fitting to end it there.